There are surely a number of people in the firing line in the current NI water debacle. While the senior management are rightly responsible for the response and communication issues, I certainly believe that as a public body NI Water should have emergency and contingency planning. Where is the ministerial input in this as this has failed? Also for short term popularity the Assembly has deferred water charges affecting infrastructure upgrades. For this the Assembly Members who voted for this delay are surely to blame. Also why has it taken until 30th December for an emergency session at Stormont while citizens have been in dire need for over a week? Just to clarify, the session the reader refers to was actually a meeting of the Executive and not the NI Assembly. Has the Green Party lost the plot? They have one MLA and what is he trying to do but bring in a Hunting Ban Bill that is a copy of possibly the worst piece of law ever to be passed in government history. The hunting act has nothing to do with animal welfare and all to do with class war. The green party says it causes suffering to chase a hare or a fox with a dog. Number one, prove it and number two why is it not then cruel to chase a rabbit with the same dog? My point is this, why should I change my life to suit another just because they don’t agree with me? After years of one sided arguments in Northern Ireland resulting in one sided laws do we really want more? I’ll end with one for anyone who cares. 10 years ago there were no hares in 99 percent of county down now they are thriving and its through gun clubs and a few dog men and their reintroduction work and not a ban on coursing. What do you think? The Bill in question can be found on the Assembly’s website and one of its stated objectives is “The Bill will prohibit the hunting of wild mammals with dogs except where it is carried out in accordance with the conditions of an exemption”. 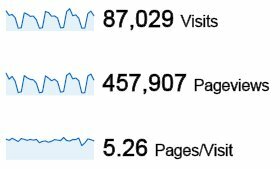 This post is part of our ongoing commitment to publish web stats for www.niassembly.gov.uk (“the site”). an average of 5.26 pages per visit. As you would expect, Windows is the dominant operating system accounting for 96.17% of visits to the site with 2.26% of visitors using OS X (Apple). 43.28% of our users have a screen resolution of 1280 (width) x 1024 (height), while 27.66% have a resolution of 1024 x 768. There have been 777 visits to the website from mobile devices. The iPhone is the most popular device with 409 visits, Android is second with 124. In total OS X (iPhone, iPod, iPad) account for 529 of the 777 visits (68%). The monthly web stats overview is available to download here (PDF) and you can view the top 500 pages here (PDF). Are there any plans in the pipeline which would see a change in the consociationalist coalition towards a government and official opposition system within the Northern Ireland Assembly? The system of government used in Northern Ireland was established in the Northern Ireland Act 1998, signed by both the UK and Irish Governments. I would like to know how many members are required to attend the various sessions and debates and how we can find out whether and how they voted. It seems that there is no accountability and if a member fails to attend there is no record or consequence. On 22nd June there was a vote on the Wildlife and Natural Environment Bill but only 41 of a possible 108 MLAs were in attendance. How can a vote be held with fewer than half of the members present?